Happy Halloween you spook-tacular ghouls! I hope you all have some amazingly witchy plans cooked up for the best day of the year. My day consists of going to yoga in mermaid leggings and stuffing all the yogis faces with Halloween treats, then stuffing my friend's children's faces with Halloween treats, and then going to the bar with friends and stuffing their faces with Halloween treats. This will be followed by a solo The Twilight Zone marathon, where I will, you guessed it, stuff my face with Halloween treats. If you couldn't tell, I love stuffing people's faces with Halloween treats. 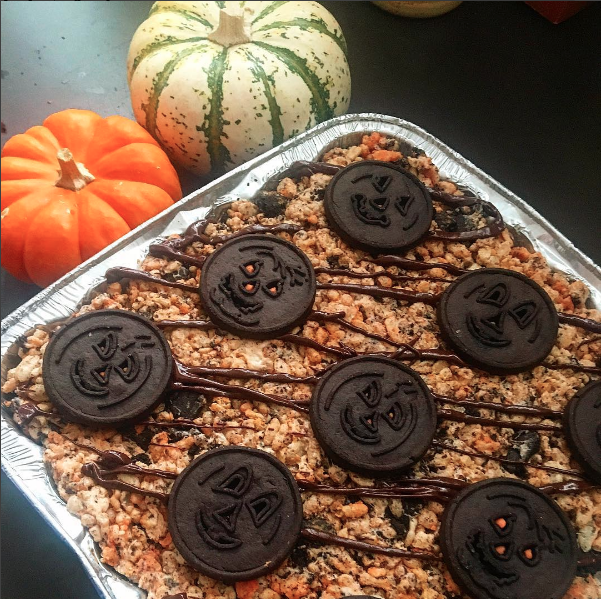 After posting my Jack-o'-lantern Rice Krispies Treats on Instagram, I've gotten a lot of requests for the recipe. So, I've decided to take out my spell book and give you the incantation, errr, recipe for them. They are an easy, delicious crowdpleaser, and they are so adorable, you almost feel bad eating one. Almost. These are vegan and nut-free. They're gluten-free too if you omit the Halloween Joe Joe's or use Trader's Joe's Gluten-Free Joe Joe's, but they won't be as cute. Sorry all you gluten-free people. 1. In a large pot, combine the marshmallows, margarine, pumpkin puree, pumpkin pie spice, and salt. Mix over medium heat until marshmallows are completely melted. 2. Add Rice Krispies and chopped Joe Joe's and mix until well combined. 3. Press into greased 9x9 pan. Drizzle melted chocolate on top and stick on Joe Joe tops. 4. Allow to cool and cut into 9 equal pieces.